The tournament was unfinished, but there are several quite different versions of the scores. Feenstra Kuiper gives only a score of 8.5 for Anderssen. Spinrad gives several interpretations, including the possibility that Anderssen and Horwitz played two games, one being a draw, and I have followed what seems to be Spinrad's best guess, with the addition of a win by Deacon over Löwe, given at the La Grande Storia degli Scacchi web site, which otherwise matches Spinrad quite closely (except the extra Anderssen-Horwitz draw). The win by Deacon over Löwe is given in The Chess Player where it is specifically identified as being from this tournament. Di Felice gives only totals (+,-,=) for each player, but these differ from Spinrad. Spinrad says Kieseritzky scored +1-2; Di Felice says +2-1; La Régence agrees with Spinrad. Spinrad says Mayerhofer scored +2-1; Di Felice says +2-2. Spinrad says Horwitz scored -1=1; Di Felice says +1-1=1. Spinrad says Szabo scored -2; Di Felice says +1-1. Spinrad says Harrwitz scored +1-1; Di Felice says -1. And Di Felice says Löwe scored -3 but Spinrad says -1 and La Grande Storia degli Scacchi says -2. The Illustrated London News (4 Oct. 1851, p.411) mentions that Anderssen beat Löwenthal in this event. 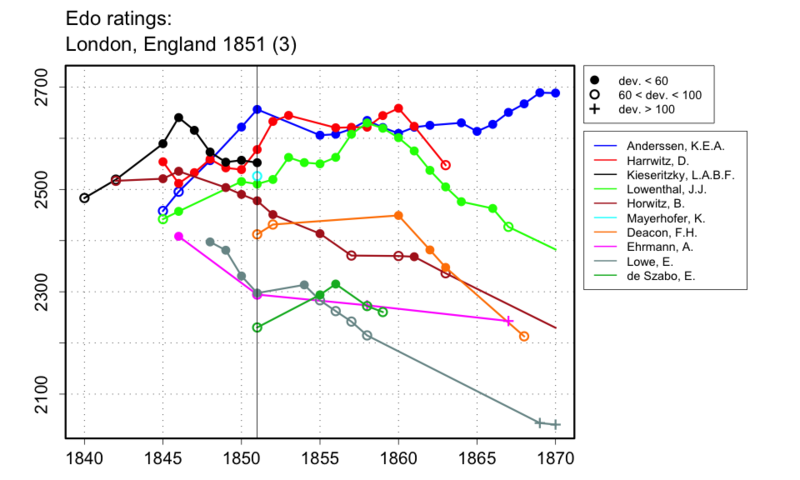 Bell's Life in London (23 Nov. 1851) has Mayerhofer's win over Harrwitz and Anderssen's win over Deacon. The issue of 30 Nov. 1851 has Anderssen's win over Kieseritzky. The issue of 29 Feb. 1852 has Mayerhofer's win over Kieseritzky. A draw between Löwenthal and Ehrmann, not mentioned by any of my other sources, and specifically stated to be from this tournament, appears in Bell's Life in London, twice with different annotations (16 Nov. 1851, and 21 Dec. 1851).